This section is meant to serve as an introduction to adeno-associated viruses for colleagues who are relatively new to the field, but are interested in learning more about it. As one might imagine, this field is complex and rapidly changing. After reading through hundreds of articles, we have extracted the key pieces of relevant information, and put them together in a way that is relatively easy to follow for those who may not have a Ph.D. on AAV. We start with the biology of AAV, then the general principle and methods for rAAV production, and end with a note on the myth about DNA persistence and relatively long-term AAV transgene expression. There is some important information not included here. Although it would help you further understand the finer aspects of AAV, it would be overwhelming if it was all present, especially for those who are newcomers to AAV. To continue your reading with this additional information, please refer to our supplementary notes. Vector Biolabs offers AAV custom production services as well as a complete catalog of AAV products. How is Recombinant AAV2 Produced? How are Hybrid rAAV Vectors Developed? The first human adeno-associated virus (AAV) was discovered in 1965, as a contaminant of adenovirus (Ad) preparations, hence the name. It is one of the smallest viruses with a non-enveloped capsid of approximately 22 nm. Although 80-90% of adults are sero-positive with AAV2, infection has not been associated with any symptoms or disease. Because a co-infecting helper virus (such as adenovirus or herpes simplex virus) or induction of cellular stress is usually required for a productive infection to occur, AAV serotypes are ascribed to a separate genus in the Parvoviridae family designated Dependovirus. AAV has a linear single-stranded DNA (ssDNA) genome of approximately 4.7-kilobases (kb), with two 145 nucleotide-long inverted terminal repeats (ITR) at the termini. The virus does not encode a polymerase and therefore relies on cellular polymerases for genome replication. The ITRs flank the two viral genes – rep (replication) an”yd cap (capsid), encoding non-structural and structural proteins, respectively. The rep gene, through the use of two promoters and alternative splicing, encodes four regulatory proteins that are dubbed Rep78, Rep68, Rep52 and Rep40. These proteins are involved in AAV genome replication. The cap gene, through alternative splicing and initiation of translation, gives rise to three capsid proteins, VP1 (virion protein 1), VP2 and VP3, with molecular weight of 87, 72 and 62 kDa, respectively. These capsid proteins assemble into a near-spherical protein shell of 60 subunits. Immunofluorescence results suggest that capsid assembly is confined to the nucleoli of infected cells. Fully assembled AAV capsids enter the nucleoplasm in an AAV Rep-dependent manner. Selective AAV DNA encapsidation is presumably directed by protein-protein interactions between two complexes: (1) the pre-formed empty capsids and (2), complex of Rep78 or Rep68 with the virus genome. Next, the Rep52 and Rep40 proteins are responsible for transferring the AAV genome DNA into empty particles through the pores. It should be noted that this is just one of the many working hypotheses for AAV replication. AAV2 attachment is primary mediated by heparan sulphate proteoglycans, while internalization is aided by the co-receptors, such as avb5 and FGFR1 etc. The use of ubiquitous heparan sulphate proteoglycans as docking sites explains in part the well-known broad tropism of this virus. However, the events and processes that regulate the trafficking of AAV particles into the nucleus are still not fully understood. After entry into the host cell nucleus, AAV can follow either one of two distinct and interchangeable pathways of its life cycle: the lytic and the lysogenic. The former develops in cells infected with a helper virus such as adenovirus or herpes simplex virus (HSV), whereas the latter is established in host cells in the absence of a helper virus. When AAV infects a human cell alone, its gene expression program is auto-repressed and latency is ensued by preferential integration of the virus genome into a region of roughly 2-kb on the long arm (19q13.3-qter) of human chromosome 19, designated AAVS1. This site-specific integration involves the AAV ITRs and Rep proteins (Rep78, Rep68). When a latently infected cell is super-infected with a helper virus, such adenovirus or herpes simplex virus, the AAV gene expression program is activated leading to the AAV Rep-mediated rescue (i.e., excision) of the provirus DNA from the host cell chromosome, followed by replication and packaging of the viral genome. Upon helper virus-induced cell lysis, the newly assembled virions are released. The induction of the lytic phase of the AAV life cycle from a stably integrated provirus can also occur in the absence of a helper virus, though with a lower efficiency, when the host cell is subjected to metabolic inhibitors, DNA damaging agents or genotoxic compounds. AAV2 is probably the most widely used AAV serotype for in vitro and in vivo gene delivery. However, many other serotypes of AAV have been isolated, and every year there are new serotypes being discovered. Among them, AAV1, AAV2, AAV5, as well as AAV7, 8 and 9 etc, have been used for gene delivery studies. The question is: among these serotypes of AAV, which serotype(s) is appropriate or best for a particular study model? Though there are numerous studies comparing the efficacy of gene delivery in various models, the data are quite often controversial, if not conflicting. The exact reason for this is not clear. Many different factors, such as difference in animal species involved, study protocols, end-point readout, tissue or organs, as well as the procedures used to prepare those recombinant viruses etc, could contribute to this. If possible, it is a good idea to compare the efficacy of gene delivery by several rAAVs carrying a reporter gene, such as GFP or LacZ, to decide which serotype and procedure is the appropriate for your particular study. Given the fact that the AAV ITRs contain all cis-acting elements involved in genome rescue, replication and packaging, and the fact that the AAV ITRs are segregated from the viral encoding regions, i.e., Rep and Cap gene regions, recombinant AAV vector design can follow the whole gene- removal or “gutless” vector design rationale, as in the retrovirus system. In other words, the cis-acting viral DNA elements involved in genome amplification and packaging are in linkage with the heterologous sequences of interest, whereas the region(s) encoding trans-acting viral factors involved in genome replication and virion assembly are provided in trans. Typically, rAAV particles are generated by transfecting producer cells with a plasmid (AAV cis-plasmid) containing a cloned recombinant AAV genome composed of foreign DNA flanked by the 145 nucleotide-long AAV ITRs, and a separate construct expressing in trans the viral rep and cap genes. The adenovirus helper factors, such as E1A, E1B, E2A, E4ORF6 and VA RNAs, would be provided by either adenovirus infection or transfecting into production cells a third plasmid that provides these adenovirus helper factors. Given that HEK293 cells, a commonly used AAV production cells, already contains the E1A/E1b gene, the helper factors that need to be provided are E2A, E4ORF6 and VA RNAs. Significant progress has been made regarding the production of recombinant AAV, particularly recombinant AAV2, from which the production methods for other serotypes have been derived. Many approaches have been taken to improve AAV vector production, but two strategies differing in principles are now the most widely used, depending on how the adenovirus helper factors are provided. One method relies on wild-type adenovirus infection into the cell lines that stably harbor AAV rep/cap genes, as well as the AAV vector DNA. The other method, the helper-free method, is based on the adenovirus-free transient transfection of all elements that are required for AAV production in host cells such as HEK293 cells. It involves the co-transfection of AAV production cells with 3 plasmids: (1) an AAV2 ITR-containing plasmid carrying the gene of interest; (2), a plasmid that carries the AAV2 Rep-Cap; and (3), a plasmid that provides the helper genes isolated from adenovirus. Although the method using wild-type adenovirus-inducible AAV producer cell lines can be easily scaled up in cultures and produce AAV vectors with very high titers, it is very challenging to completely eliminate the adenovirus from AAV product, and contamination of wild-type adenovirus is highly undesirable in terms of vector safety and specificity. On the other hand, although the transient-transfection method generates high-titer AAV vectors that are free of adenovirus, the process is very labor labor-intensive and expensive. Of course, different techniques for producing recombinant AAV have also been developed, though they are not that commonly used as the two we discuss here. Although AAV2 is the most extensively studied serotype, and significant process has been made in its production, for some tissues and cell types, transduction efficiency is low. Therefore, an important area in the development of AAV as a vector concerns the engineering of altered cell tropisms to narrow or broaden rAAV2-mediated gene delivery and to increase infection efficiency. Between various AAV serotypes, the difference in transducing efficiencies could be caused by a difference in their respective receptor content on target cells. A strategy to alter rAAV tropism exploits the natural capsid diversity of other serotypes, by packaging recombinant AAV2 genomes into capsids derived from other AAV isolates. The commonly used approach employs hybrid trans-complementing constructs that encode rep from AAV2, whereas cap is derived from the other serotype displaying the cell tropism of choice. For instance, if it is the rAAV2/5 that is to be produced, and if the production method is based on the helper-free, transient transfection method discussed above, the 1st plasmid and the 3rd plasmid (the adeno helper plasmid) will be the same as discussed for rAAV2 production. However, the 2nd plasmid, the pRepCap will be different. 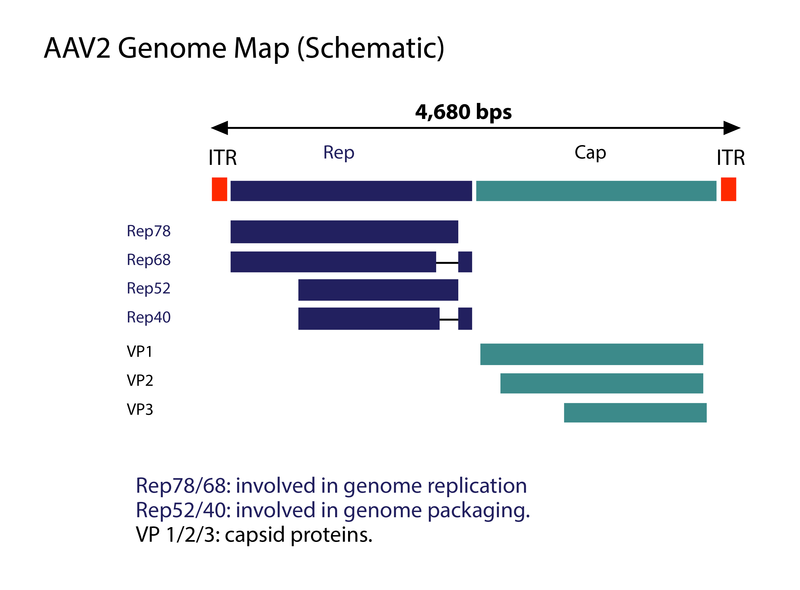 In this plasmid, called pRep2/Cap5, the Rep gene is still derived from AAV2, while the Cap gene is derived from AAV5. The production scheme is the same as the above-mentioned approach for AAV2 production. 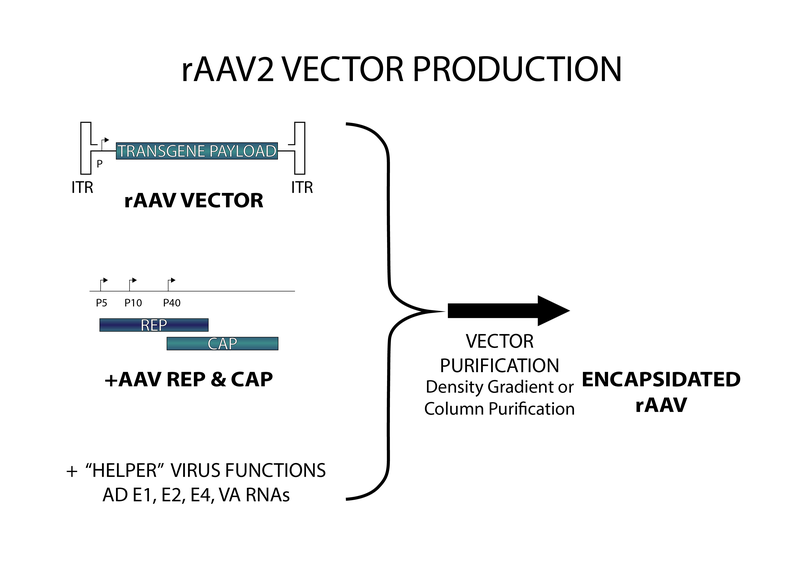 The resulting rAAV is called rAAV2/5, in which the genome is based on recombinant AAV2, while the capsid is based on AAV5. It is assumed the cell or tissue-tropism displayed by this AAV2/5 hybrid virus should be the same as that of AAV5. 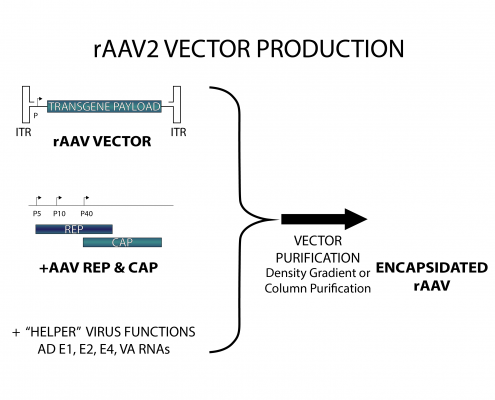 Even though the production of these hybrid rAAV vectors is the same as for rAAV2, the purification procedure can be quite different, due to the differences in capsid properties. Recombinant AAV gives prolonged and stable expression in numerous animal models without notable toxicity. Before transgene expression can occur, the single stranded rAAV DNA needs to be converted into a transcriptionally functional double-stranded template. It is important to note that this stability does not arise due to foreign DNA insertion into the parental virus pre-integration site (AAVSI), since the absence of rep gene products prevents DNA targeting to the AAVS1 locus. Now the question is: how is the long-term transgene expression achieved? Recently, it was proposed that, after the single- to double-stranded DNA conversion, a duplex rAAV genome is formed, through either intra- or inter-molecular recombination at the ITRs. This duplex rAAV could either exist in a circular form or linear concatemers. It is the circular forms that are thought to be responsible for vector persistence and long-term transgene expression.